We’d love your help. 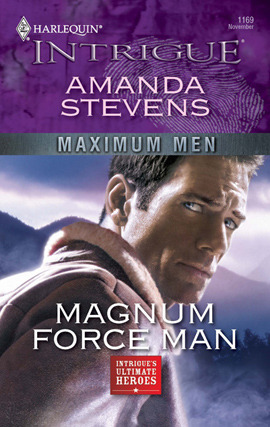 Let us know what’s wrong with this preview of Magnum Force Man by Amanda Stevens. He had little memory of who he was or where he'd been, but the images that kept flashing through his mind meant computer genius Claudia Reynolds was headed for danger and only Jack Maddox could rescue her. Although they'd technically met before, it wasn't until the bullets started to fly that the blond beauty was convinced to follow him through the remote South Dakota woods…far from the mysterious facility that Jack had once called home. Now, as Jack sensed they were closing in on answers too many people had died covering up, the long-forgotten pain buried deep in his past proved their connection was the only thing he could rely on. And the only thing keeping Claudia alive. To ask other readers questions about Magnum Force Man, please sign up. Having witnessed her mentor’s murder two years ago, Claudia Reynolds has been on the run ever since. Hiding in a remote cabin, she hopes her pursuers wouldn’t find her and dreads the day they do. When a stranger runs into the middle of the road in a storm, right planting himself right before her car, she fears her running days are over. But the stranger with the soulful blue eyes has apparently been sent to save her. But can she trust a man who has no idea who he is, beyond his name, and has no r Having witnessed her mentor’s murder two years ago, Claudia Reynolds has been on the run ever since. Hiding in a remote cabin, she hopes her pursuers wouldn’t find her and dreads the day they do. When a stranger runs into the middle of the road in a storm, right planting himself right before her car, she fears her running days are over. But the stranger with the soulful blue eyes has apparently been sent to save her. But can she trust a man who has no idea who he is, beyond his name, and has no recollection of his past. And is he really her guardian angel or the devil sent there to kill her? This book was an acquired taste, but a really good read once you get into it. The suspense was subtle, but nicely executed, with the story concentrating more on the hero and the whys and hows of him actually being there. I liked the style, the story flowed nicely, and for once I didn’t dislike the heroine. Sure, she was suspicious, be she had her reasons, and her adversity of trusting a complete stranger wasn’t overdone. The author succeeded in maintaining a good balance between stubborn and cautious in Claudia and I applaud her for it. It’s the slight paranormal angle that made all the difference in this book for me. Paranormal romance is my favorite genre and when aspects of it influence other stories, I’m a happy reader indeed. This reminded me slightly of Christine Feehan’s GhostWalkers with the pre-cog hero, a telepathic link to a distant voice in both the hero’s and heroine’s heads, the top-secret, hush-hush facility where such special talents are developed to the maximum etc. This was a great start to what will hopefully become a series. Good premise, plot, and pacing combined with nicely-drawn characters (though they could’ve been developed a wee bit more), a nice dash of paranormal, a pinch of romance, and great, yet subtle suspense elements. I bought this book because I think the author is the same one who wrote the Graveyard Queen series. That series is way better. I didn't like this one at all. It has a great premise, and I think it sets up a series, but it's not for me. So Claudia worked in a lab and her mentor was murdered. She witnessed the killer leaving the scene, and she herself became a target. Two years later, a man jumps out in front of her car on her way up to her isolated cabin. When he comes t Review posted on Got Fiction? So Claudia worked in a lab and her mentor was murdered. She witnessed the killer leaving the scene, and she herself became a target. Two years later, a man jumps out in front of her car on her way up to her isolated cabin. When he comes to, he has no memory. All he can tell her is that she's in danger and he's there to protect her. The way Claudia sees it, he is the danger. Jack reminds me of that nineties TV show called The Pretender on some level. He was taken as a child to live in isolation with his twin brother Jared. The man who took them tries to enhance their precognition/telepathic powers. But by the time they're teens, they realize this man is a very bad man. Their escape is short-lived, and they're transferred to a place called The Facility. It is here that Jack starts to have visions of Claudia. When he realizes she's in danger, he and his brother devise another escape plan. Jack finds Claudia, and saves her...for now. I think the next book is about Jared, Jack's twin. But I don't think I'll continue on. I didn't like this enough. I think three quarters of the book is Claudia waffling back and forth between Is he going to kill me? Or is he here to save me? I didn't like her, and for this kind of a paranormal plot, you need more pages than we get. It was an ambitious idea, and I didn't think it worked with the shorter word count of a Harlequin Intrigue. However, the concept is there, and the premise is good. I just didn't like the writing style much. The Graveyard Queen series is definitely a far superior series. The storyline, the characters, and the writing are all much more in-depth. Read that instead. very boring, the book drug on. The Graveyard Queen Amanda Stevens is the award-winning author of over fifty novels, including the modern gothic series, The Graveyard Queen. Her books have been described as eerie and atmospheric, “a new take on the classic ghost story.” Born and raised in the rural south, she now resides in Houston, Texas, where she enjoys binge-watching, bike riding and the occasional Horror Night with friends.